. . . From the point of view of the scientific observer rather than that of the participant and believer, we may speak of trance in somewhat different terms. We may define it as a state of altered consciousness; that is, a state in which one or several psychological and physiological changes occur: a change in the perception of time and form, of colors and brightness, of sound and movement, of tastes and odors, a change in the feel of one’s own body, in sensations of pain, or heat or cold, of touch; a change in memory or in notions of one’s own identity. Such changes may last for shorter or longer periods, may be of greater or lesser intensity, may be frequent or rare or even a single event in the life of the individual. They may be fleeting experiences given little or no cultural interpretation or value, they may be terrifying events of major proportions. 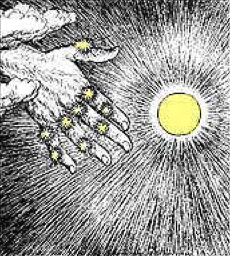 Or they may be prized and cultivated, intentionally induced, as a means toward a supreme experience of the self or of the powers of the universe. The reader will recognize in these comments some of the effects attributed to hallucinogenic drugs. The whole field of altered states of consciousness has in recent years acquired a popular fascination and an aura of familiarity. But drugs are only one of many ways to achieve such states. They have been sought, or feared and avoided, given cultural explanations and treated ritually in many hundreds of societies for thousands of years. The “psychedelic movement” and the “psychedelic experience” in contemporary America represent only a special, local variant of a major theme in human cultural history. While trance states can be—and often are—induced by drugs, in the ritual context these methods are especially typical of South American Indians and of some North Asiatic peoples. Where drugs are used the aim will be to have visions, to communicate with spirits, to gain special powers, to send one’s soul on errands to find lost objects or to bring back the abducted souls of sick persons. Indeed, the Siberian or South American shaman sends his soul “on a journey”— and we are not very far from the hippy term, “to take a trip.” Elsewhere, particularly in Africa and among descendants of Africans in the Americas, drugs are rarely used for this purpose. Nor are dissociational states generally utilized to attain visions or insights. Instead, they are part of public ceremonial occasions in which dissociated individuals are believed to be possessed by certain spirits and act out the behavior of these spirits. Typically, musical rhythms associated with a given spirit or group of spirits are played, and the trancers dance the characteristic steps and movements of the spirits. 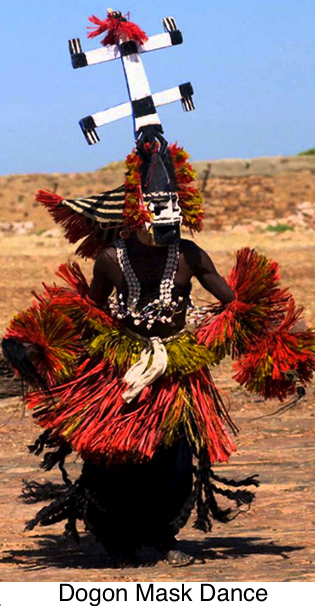 They may be dressed to fit the part, often in elaborate costumes, but significantly, while impersonating the spirits, they generally do not wear masks. Masks, representing other groups of spirits, involve a different type of impersonation and are associated with other occasions, other dances and other dancers. . . .
Like the mask, the possession trance phenomenon is intimately related to the dance. Indeed this is the kind of trance state (or dissociational state) most frequently linked to the dance. Non-possession trance, particularly the drug-induced variety, is essentially a passive, subjective and private experience, even when it occurs to several persons at the same time or to one person in the presence of others. The effect of the drug is likely to alter the perception of sound, of music and rhythm, and to limit more or less severely the controlled, co-ordinated and disciplined execution of patterns of motion. This in itself would tend to make dance performance unlikely. Possession trance, with its emphasis on impersonation, is an objectively demonstrated, active, public phenomenon. It requires an audience not only to validate the experience but, in most cases, to bring it about in the first place. Furthermore, possession trance may at times be more significant for the group that observes it than for the individual who experiences it; this is particularly true when, as is frequently the case, the experience is not remembered by the subject. The dance and the accompanying music may be used to initiate dissociation, or, in the language of the believers, to “invite” the spirits; or the dance may be the characteristic motion of the spirit. Or again—where the spirits are to be dispatched, forcing the trancer to dance to exhaustion, to unconsciousness—the dance may be the preferred method of exorcising or removing the possessing, interfering, alien spirit. Dance, music, handclapping, singing, costuming, the presence of an expectant and participating audience, a ritual setting at an appropriate place and time—all these are ideally suited to produce both induction of dissociation and the therapeutic results of the ritual. Expectation and suggestion are obviously of great importance in bringing these about. The music, with its increasing frequency and intensity, facilitates rhythmical movement and itself has a clear psychological effect: it may help to release the dancer of part of his responsibility for his movements and actions. But it may have a physiological effect on the brain as well, helping to induce dissociation. The dance itself will contribute to an alteration of breathing patterns; it may bring about hyperventilation and—if prolonged—partial exhaustion, both of which again facilitate dissociation. Another significant factor, however, is to be found in the frequent whirling and turning, of circular and rotational movements. These tend to affect the sense of balance and equilibrium, thus leading to dizziness. Disturbances of balance are likely to be experienced, involving a loss of control over the body and thus over the self. They may indicate the impending loss of consciousness. If, furthermore, a disturbance in the sense of balance is believed to be a preliminary to possession, to being “mounted” by a spirit as it is so frequently phrased, this in itself will contribute to the likelihood of the occurrence of trance. Thus there are many types of ritualized, patterned forms of trance; there are many types of beliefs in possession by spirits. In fact, several such types of trance and spirit-possession belief may co-exist in the same society or in different segments of the same society. When trance is interpreted as due to spirit possession and when spirit possession finds its expression in states of trance, then we are also likely to find a linkage between trance and dance. Non-possession trance more rarely uses the dance as its vehicle of expression and it is least likely to do so when hallucinogenic drugs are employed. Where spirit possession trance occurs, the trancer impersonates the spirit, but he is unlikely to utilize masks among his accessories. Ritualized, formalized dissociational states are found worldwide, are given a great variety of cultural interpretations and are embedded into many different institutions, customs, traditions and practices, most of which are religious in nature. The very wide distribution of these states among the peoples of the world would suggest that they are very ancient. We cannot trace their origins in the nearly two million years of human evolutionary history and to speculate about these origins would be rather pointless. . . . However, if we are more modest in our aims and look back to the span of five thousand years of recorded history, we meet many ancient examples of ecstatic dance involving experiences of dissociation and, often quite explicitly, a statement of belief in supernatural possession or union with the Divine. Our own Western tradition has its deepest roots in the Mediterranean world of Jew and Greek, and we find what we are looking for in both of these traditions. For example, we are told in the Bible (I Samuel 10) that Saul traveled with a company of ecstatic prophets. “And David danced before the Lord with all his might.” (II Samuel 6). He leaped and danced ecstatically before the Ark while he and his men played on such instruments as harps and psaltries, timbrels, cornets and cymbals, as the King James Version lists them. Ecstatic and dissociated behavior, visions and voices, appear throughout the Bible, both in the Old and New Testaments. “Trance Dance Induction Methods” by Erika Bourguignon is an extract from The Highest State of Consciousness edited by John W. White, published by White Crow Books and available from Amazon and other bookstores. 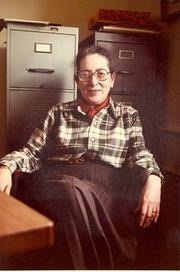 Erika Bourguignon was Professor Emerita of Anthropology at Ohio State University, where she taught for more than 40 years. She is best known for her contributions to psychological anthropology, anthropology of religion and anthropology of women. Working with Dr. Erika Bourguignon was a significant turning point for Cuyamungue Insitute’s founder, Felicitas Goodman. In 1973 Felicitas worked with Erika on a comparative study of 488 indigenous societies around the world. They found that 90 percent used at least one culturally institutionalized method to experience an altered state of consciousness. This became a significant clue that launched Felicitas on the path to re-discover the ritual postures.